Products are made in small batches from ingredients that are natural and about half of the ingredients arrive fresh each day. 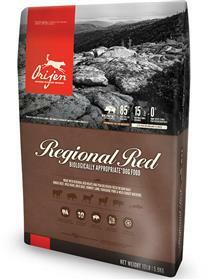 Orijen does not use chemical preservatives or artificial coloring. The amount of fresh meat that is used, give the kibble a unique shape, smell and color. There are added protein sources to each formula to give more taste and nutrients to the formulas. Fresh meats are low in calcium and phosphorus, which helps make each formula balanced. New Formula Ingredients: Deboned beef, deboned wild boar, deboned goat, deboned lamb, lamb liver, beef liver, beef tripe, wild boar liver, deboned mutton, beef heart, whole atlantic mackerel, deboned pork, goat meal, wild boar meal, lamb meal, mackerel meal, whole green peas, whole red lentils, whole pinto beans, beef kidney, pork liver, herring meal, whole chickpeas, whole green lentils, whole navy beans, beef meal, whole yellow peas, lentil ﬁber, natural pork ﬂavor, pork kidney, beef fat, herring oil, mutton meal, lamb tripe, wild boar heart, whole pumpkin, whole butternut squash, kale, spinach, mustard greens, collard greens, turnip greens, whole carrots, whole apples, whole pears, dried kelp, freeze-dried beef liver, freeze-dried beef tripe, freeze-dried lamb liver, freeze-dried lamb tripe, pumpkin seeds, sunﬂower seeds, zinc proteinate, mixed tocopherols (preservative), chicory root, turmeric, sarsaparilla root, althea root, rosehips, juniper berries, dried lactobacillus acidophilus fermentation product, dried biﬁdobacterium animalis fermentation product, dried lactobacillus casei fermentation product.